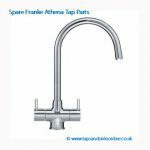 With 30 years experience of selling UK Kitchen Taps and providing aftercare service (to both UK Kitchen Taps we have supplied, and sometimes taps we have not! ), here is a simple kitchen taps troubleshooting guide for the most common problems that can / might occur with a kitchen tap. 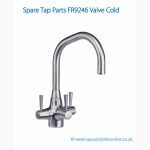 If in doubt always contact your plumber or contact US at sales@tapsandsinksonline.co.uk and We will do our best to provide you with the necessary spare parts and expertise. Dripping Kitchen tap: Water dripping from the end of the kitchen tap spout when the kitchen tap is turned off. New kitchen taps can sometimes take a few days for the rubber washer to "bed down". If after a few days the dripping continues, the seating and/or the rubber washer have been damaged by debris in the plumbing system. Please order a new valve, and flush the system. Dripping Kitchen tap (2): Water dripping from the end of the spout when the tap is turned off. High pressure in your plumbing system. Check the pressure in your system: if it is too high, more than 5 bar, it could be necessary to use a pressure reducer, contact our after sales service. Kitchen Tap leaks at the joint of the body & spout The spout "O" rings have been damaged during installation. It needs new rubber "O" rings. Kitchen Tap leaks under the work- top The kitchen tap tails have not been screwed in tight enough.The plumbing installation may be suspect. Tighten the kitchen tap tails without damaging or deforming the plumbing. Kitchen Tap leaks by the handles. The valve may need tightening or replacing. Tighten the valve or order a new valve See our spare parts section If a valve bush is present, order a new set of valve and valve-bush. It is always a good idea to check first with us as so many valves and sizes out there. Water outlet is clogged with stain deposit or impurities Debris introduced during local water authority construction and refurbishment or in the water has clogged the antisplasher. Unscrew the antisplasher and clean it. Turn off the hot & cold water supply under the sink unit. Remove the little indice (i.e. blue/red or C/H). Unscrew the handle screw and remove the handle. Unscrew and remove the damaged valve. Clean the surface of contact of the valve gasket. Screw in and tighten the new valve and re-assemble in reverse order. Unscrew the spout collar by hand. Pull the spout out of the body of the tap. Remove the two black “O” rings. Fit new greased “O” rings. Gently push the spout into the body. Care must be taken when reinserting the spout into the body to ensure that the grub screw is located in the split of the white PTFE ring. Screw the spout collar, hand tight. Turn on the hot & cold water. I have an Olympus Franke tap … I can not remove the tap handles / levers despite removal of the grub screws to get to the valves ! Any ideas /tips..? 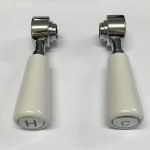 Hi Dan, the handles could be wedged off using a screwdriver but you need to be extremely careful not to scratch the handle of the body of the tap. You could also spray some WD 40 onto the handle and then try and wedge off with the screwdriver, then afterwards wash the handle and body with some Milton. But we would always advise consulting a plumber if you are experiencing difficulties. If you do need to bring a plumber on board what you could do is have the spare parts ready for him to replace once handles removed. 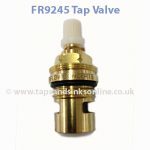 Our Plumbing Tip Blog ‘My Franke Olympus Tap is dripping’ provides you with a link to all the Franke Olympus Spare Tap parts and further information which might also be of use. Thanks Alice , tell me does the handle come away on its own or does the cylinder come away as well ? I have a spare valve and am ready to go but unsure where to apply pressure and what should move ? Just the handle or the handle and cylinder its attached to????? I have an Abode Ludlow monoblock tap, which is dripping form the top – is there any way of identifying if it is hot or cold valve that needs replacing? – or do I just have to replace both?! My mono bloc tap just shot into the air! We turned off the water, but when we replace the tap, it rises away from the plate when water is turned on. Once the hot valve is re-opened, it comes off again. Can anyone help? HI Kosta, have you checked the water pressure on the hot side ? is it too high? Have you also checked that all the grub screws securing your tap are properly screwed in ?